The ‘composite-roofed’ temple represents a harmonious blend of the pent and gable styles of roofing arrangement. While, the sanctum sanctorum sports gabled roofing, the surrounding veranda or the passage, which may also serve as the circumambulatory, are covered with pent roofing. 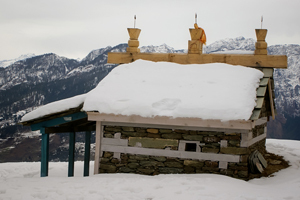 Among such temples, an interesting example may be the Durga temple at Gushaini deep in the Tirthan Valley. Besides, the Kali temple at Dobhi, the Vishnu temple at Sajala, both in the Beas Valley also belong to this temple type. This is the classical type of the northern Indian plains.